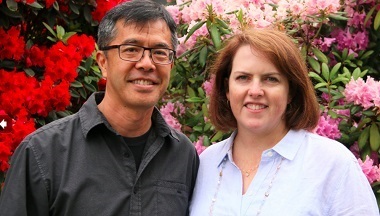 Barry and Joan Jung have been active in getting to know their neighbours over the past six years. My involvement with our neighbours first began shortly after hearing neighbourhood stories and reference to Vancouver Foundation’s 2012 Connections and Engagement Survey. The survey results and the stories prompted me and my wife to begin our practice of neighbouring. I use the term practice as I feel it emphasizes an intentionality of being an active neighbour. This act of intentional neighbouring is rooted in my faith – that to love God is to love neighbour. Residents of most Metro Vancouver cities can apply for Neighbourhood Small Grants until April 9. How many of us in our cities, towns and rural communities know the names of our neighbours, let alone love them? As a society, we tend to live outside of our neighbourhood. Our mobility gives us access to our affinity groups (sports teams, schools, children’s playdates, faith gatherings and cultural groups) that are often outside of where we live. Because of this mobility we have become fragmented from our neighbourhood and may know very little about who is living next door to us. But if we focused more on living more locally with our activities, there would be greater opportunity to engage with our next-door neighbours. I believe that to form genuine community, we are to know our neighbours and, just as importantly, we are to be known by them. I’m earnest about connecting with our neighbours in everyday living. My enthusiasm extends to encouraging others to do the same. What a joy it was when my wife and I had the opportunity to facilitate a workshop series on “The Art of Neighbouring” for our church community [Granville Chapel] last spring. These workshops were held once a week over a period of five weeks. Towards the end of these sessions we introduced a neighbourhood mini-grants program funded by our church. It was modelled after, and followed similar guidelines as Neighbourhood Small Grants. The workshops were intended to be a one-time offering but unexpectedly, word-of-mouth of this spread to other church leaders that were intrigued with our neighbouring initiatives. As I met with these leaders, I sensed their desire for their members to connect and form deeper relationships with their respective neighbours, but they weren’t clear on how or where to start. To some of us who have been working as project leaders or community activists for a while, we may take for granted the initial steps that some of us took towards this path of community building. Many in the different neighbourhoods and communities we are a part of may need reminders and encouragement to move towards a posture of neighbourliness by starting with the baby steps. Our workshops provided simple, basic, yet effective practices such as getting out the front door, taking walks in your neighbourhood, saying “hello” to neighbours, and getting to know their names. We discussed experiences about cultural and language barriers, living in apartments versus houses, and offered ideas to be more welcoming such as taking down fences or moving BBQs to the front yard. Personal stories, teaching videos, interactive group discussions and topic introductions were curated to inspire, learn and share. The stories were not only about successful interactions, relationships and celebrations but also included the sometimes challenging moments of initiating and maintaining community. Building community requires perseverance, leaning into awkward situations, mopping up some of the messy interactions and getting out of our comfort zone. We facilitated another “Art of Neighbouring” workshop series last fall with a Burnaby-based church [Hope City Church]. In early November, we hosted an evening of Neighbourhood Stories to share, encourage and inspire. We continue to be in discussion with leaders from many churches to facilitate one or two more workshops this year. These were all unintended consequences from our first workshop in the spring. We don’t know where this will all lead but we’re beginning to see some ripples. Ripples that were started some six years ago by taking that first step of becoming a neighbour on purpose. It’s been life-giving! Barry lives with his family on Cambie Street in Vancouver. He recently spoke with a group at New Life Community Church in Burnaby and will be at Fairview Presbyterian Church in Vancouver in the near future. Neighbourhood Small Grants are available to residents of Abbotsford, Burnaby, Maple Ridge, New Westminster, North Shore, North Surrey, Richmond and Vancouver. Neighbourhood Small Grants offer up to $500 to residents for projects that connect and engage neighbours, share skills and knowledge, build a sense of belonging and responsibility, and respect and celebrate diversity. Greenest City Neighbourhood Small Grants provide up to $500 for residents of Vancouver to develop projects that contribute to the City of Vancouver’s Greenest City 2020 Action Plan. The deadline for application is April 9. ← Around Town: Dementia Care, Minoru Chapel, Bar Mitzvah Boy, Art! Vancouver . . .